Following our last post on Street Food in Sicily, here is the second in our occasional series about Italian Street Food, and this time we are in Tuscany! Tuscany is home to some of the most famous dishes in Italy and perhaps not one of the places you might think of when you think of Italian streetfood. 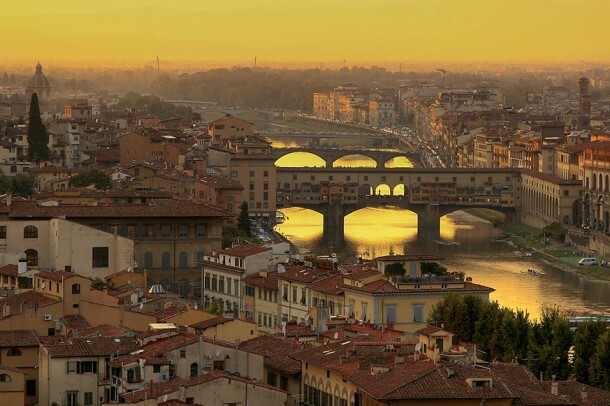 Although known for its excellent restaurants serving ‘Bistecca alla Fiorentina’ (Florentine T bone steak), Ribollita (a vegetable and bread soup) and Pappa al Pomodoro (tomato and bread soup), Tuscany and particularly Florence also hosts a fair amount of delicious streetfood you won’t want to miss! You may have seen Tuscany in the headlines recently when Florence’s Mayor made the drastic decision to force local businesses to cut down on the amount of foreign food they sell and serve, insisting that at least 70% of it must be locally sourced. This decision is meant to safeguard Florence’s historical traditions and priceless cultural heritage by protecting its culinary integrity. But what local delights does the city have to offer to its 16 million annual visitors as they trek through its streets? This is a sandwich made with Lampredotto, which is a type of tripe; more specifically it is the final part of a cow’s stomach which has been stewed for hours. 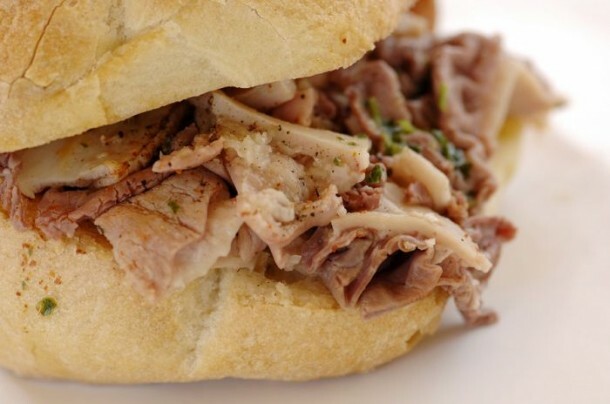 The sandwich is the cornerstone of Florentine street food and it is sold across the city by street-vendors. The bread is called semelle bread and it is a special kind of bread, round and chewy. You can eat the finely sliced, tender Lampredotto simply seasoned with salt and pepper or with the typical green salsa. If you fancy trying this local delicacy, these are said to be the best Lampredottai in Florence: Sergio e Pier Paolo, Via de’ Macci, L’Antico Trippaio, Via dei Cimatori, Il Lampredottore, Via Caccini, Mario, Piazzale di Porta Romana, I’ Trippaio Fiorentino, Via Gioberti. This is a special kind of focaccia that is made by stuffing the bread with any kind of cold cut. The traditional Florentine cold cut used in the Schiacciata is the sbriciolona, a special kind of pork salami so tender it crumbles. Don’t miss this on your next trip! Back to tripe again….but a different part of the cow’s stomach and a different way of preparing it! This dish is one of the most traditional in Tuscany. It is made of slow-cooked tripe in a tomato sauce made with onions, carrots, and celery. It must be eaten warm, served on a plate or, like Lampredotto in a sandwich! This is another great Italian streetfood to taste on the go! A sandwich stuffed with local, aromatic truffle sauce, which will make you long for more. 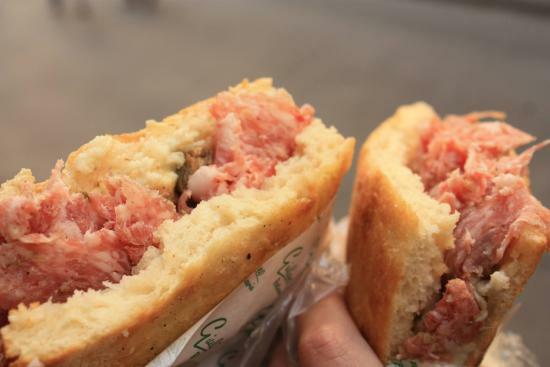 You can find this sandwich easily at any street-vendor’s car parked near the fascinating Ponte Vecchio. How could we not include a treat for the sweet-toothed!? 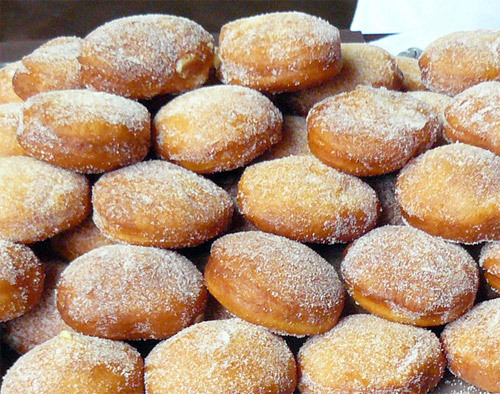 The bomboloni are puffy, round, sweet pastries covered in caster sugar… amazingly tasty! They are very popular among the youngsters in Florence, who usually have them after a night out partying in this beautiful, enchanting city. 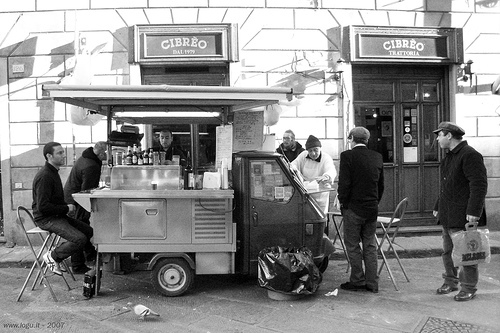 The next stop on our Italian Street Food journey will be Naples!! !